Like in many other large scale industries, production processes in the global fertilizer industry are quite well-established and proven over the years and decades. Major improvements (e.g. in terms of efficiency), are quite scarce. In contrast to that, MAN Diesel & Turbo has now introduced a holistically optimised concept for the production of nitric acid, as one of the most important feedstocks. The concept called NAMAX comes along with substantial improvements in terms of efficiency and flexibility, being valid for both new plants and revamps of existing ones. Redefining standards within the dual-pressure process, it has led to potential energy savings of several percent points for the production of this very basic feedstock for the fertilizer industry. Before and after: The new concept comes with a greatly reduced footprint in terms of size and energy consumption. 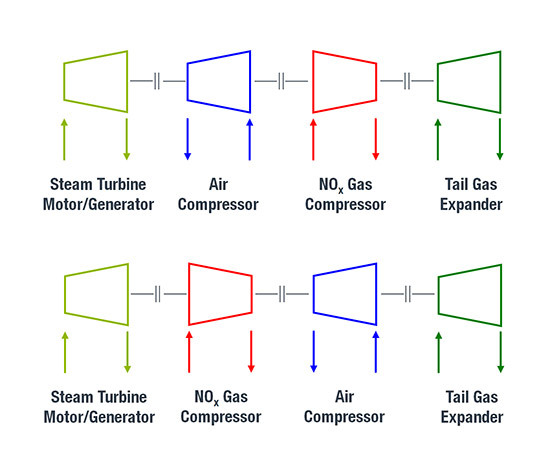 The main reason for that is quite simple: Until now, turbomachinery trains for dual-pressure process nitric acid production consist of four to five machines: an air compressor and a NOx compressor, driven by a steam turbine and an axial expander, supplemented by an optional motor/generator. These machines where bound to run on different rotational speeds. Due to the requirement for a quick-running and slow-running train part, it has not yet been possible to develop alternative train concepts. This is why the technological development of such trains primarily aimed to optimise the individual core machines; restricting the general efforts. Also, efforts to standardise the machinery trains as a whole previously failed due to the variety of customer-specific requirements, which always necessitates custom train configurations. 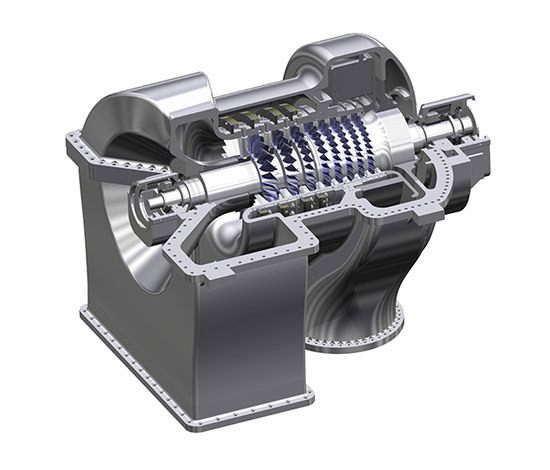 MAN Diesel & Turbo introduces its MAX1 axial compressor technology as air compressor in the NAMAX train. While being a crucial improvement for the fertilizer industry, the company has numerous references of that machine type in other branches, e.g. in air separation application and in the iron and steel industry. With MAX1 blading technology, the AG-MAX1 air compressor comes with increased power density and a higher rotational speed. Its employment in nitric acid trains enables a fundamental change to be made; equalising the speeds of the different train parts. Amongst other benefits, this increase in train speed also benefits the axial expander, which can now be manufactured up to two sizes smaller. It benefits aerodynamics, with the result that the expander, which is increasingly becoming the main drive for the train in modern processes, makes a significant higher contribution to increasing efficiency. 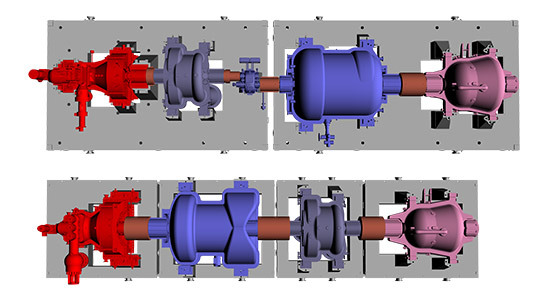 The higher speed of the AG-MAX1 axial flow compressor allows another benefit: omitting the intermediate gearbox that adjusted the different rotational speeds within the train. While the related CAPEX, frictional losses and also maintenance costs can also be omitted, this set-up allows a whole new range of design options: units can be fitted at almost any position in the train, with the exception of the tail gas expander, which can be decoupled from the process at times and therefore needs to be placed at one end of the train. The result: completely new possibilities in terms of train arrangement, according to the specific needs of each project. Less equipment with higher power density lead to the machinery trains being up to 15% shorter and 30% narrower than the standard hitherto – a significantly reduced footprint that does not only imply less space consumption within plants. And with an overall efficiency that has been improved by several percentage points, it is also the CO2 footprint that has been scaled down. Together with the modularised approach, smaller and smarter units allow benefits in terms of transportation, installation and commissioning – saving several weeks of time, and even more costs. Although most production steps in the fertilizer industry have almost reached their theoretical limits, the optimised NAMAX concept allows leaps forward to be made in terms of efficient nitric acid production. A modular approach, together with the next generation of machinery, results in significant gains in efficiency and flexibility that are quite rare in today's industry. As announced by World Fertilizer magazine, a recent project in Eastern Europe with licensor thyssenkrupp Industrial Solutions has already marked the successful market entry of the enhanced concept. It proves that NAMAX is far beyond development or testing phase. Over the course of this project, a NAMAX machinery train will play a key role in the extension of nitric acid production at the Pulawy site of Polish Grupa Azoty. While used for nitric acid production from 400 tpd to 2000 tpd, the NAMAX concept by MAN Diesel & Turbo marks a long-awaited step forward in the production of one of the world's most important feedstocks. And it’s probably one of the most impressive improvements in terms of fertilizer production efficiency.